Finding the right mix of microclover turf is necessary, as mixing it with the wrong kind of grasses or at too high of a concentration will result in the microclover taking over. However, in the right percentage, it makes a lawn stronger and greener. Micorclover is actually a legume. This species of plant pulls nitrogen out of the air and brings it down into root nodlues, then into the soil. This nitrogen being added to the soil acts as a natural fertilizer for the surrounding grass. Microclover is a hardy plant. While microclover cannot go without water for too long, it needs less frequent and lower amonts of water than regular grass. It also does well during hot and cold temperatures. Additionally, it does well under long exposure to direct sun and heat. Turf with microclover mixed in does better in areas with a lot of foot traffic than those without. Not only is it tougher, and therefore less apt to be torn up or broken, it is also has a regenerative nature. Turf with microclover will self-repair and more easily grow back when it gets worn down than turf without it. As a bonus it is resistant to many diseases that can kill grass alone. Since turf with microclover needs less watering, is self-fertilizing, and resists wear, it is much less time consuming. Less time watering not only saves labor, but it saves on the cost of water as well. Microclover is also a darker shade of green and as it only needs to be added into a turf mix in low concentration, it will create a uniformly greener look all year. 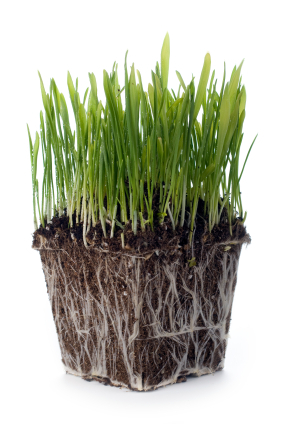 With these kinds of benefits it is hard to find a reason not to add this robust seed to your turf mixture.